A red rotary dial telephone holds the main role in my upcoming Art in the Open project, Ears Pricked, Eyes Peeled. 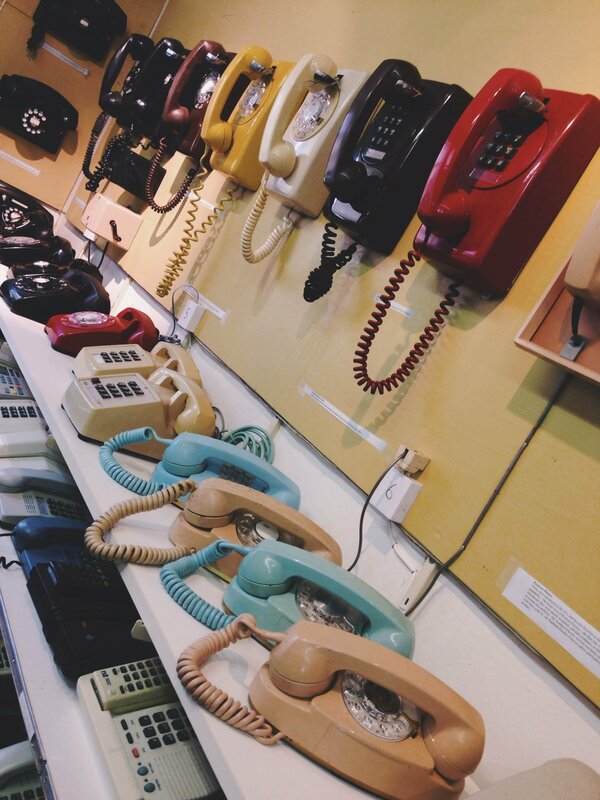 A red rotary dial telephone is not an easy item to source…at least not locally. I anticipated hours of calling and visiting every antique store on PEI, and then resorting to eBay where models sell for $60 or more…and maybe even then resorting to using another colour. However, by wonderful happenstance, the magic of Island connections and big Island hearts, I was able to acquire a bright red rotary dial phone this weekend. It’s a good story, so I’ll explain. Locating this phone began with a tip from a lone Bell Aliant employee at the warehouse on Belvedere avenue. 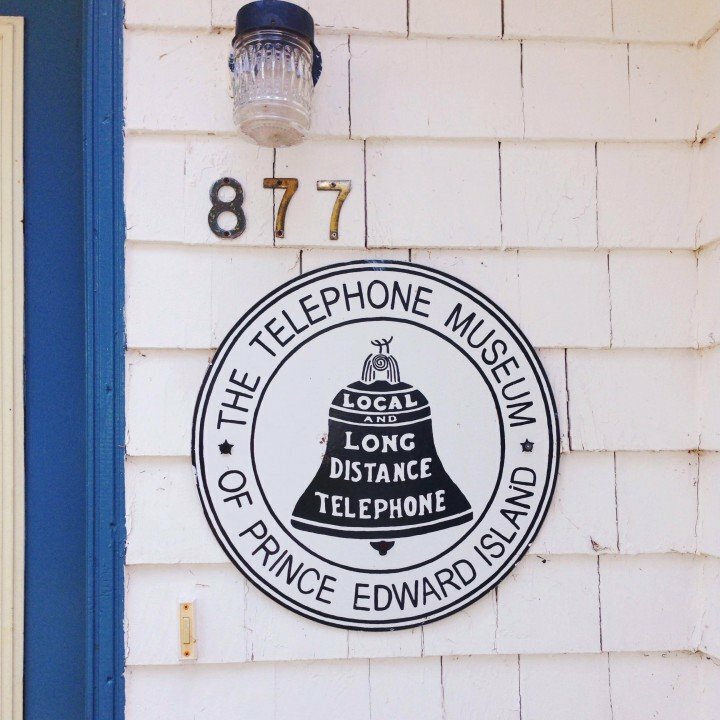 Her daughter had done a Heritage Fair project on the telecom industry in PEI, and they had visited the “Telephone Museum of PEI” to do research. 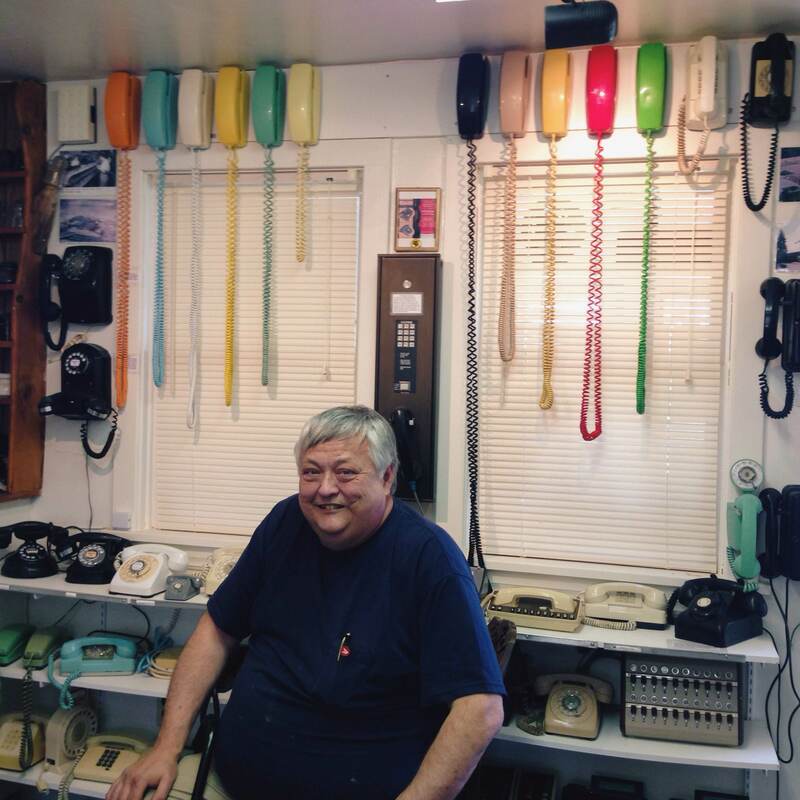 She found the email and website for the museum owner, Dave, and encouraged me to make an appointment, telling me excitedly about the hundreds of different old phones he had on display. It was my strongest lead yet. Really?! It was that easy? 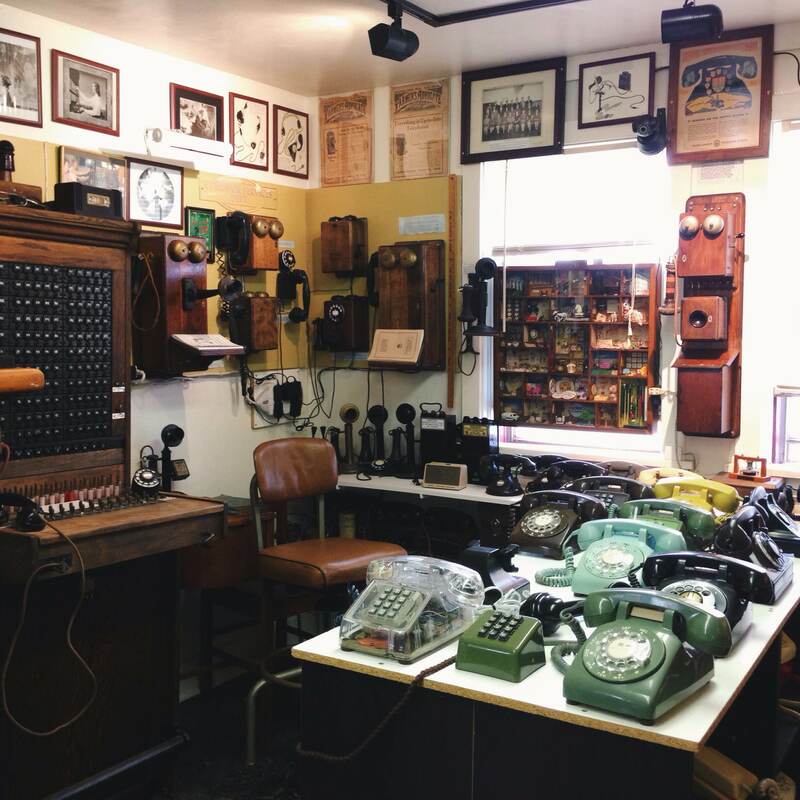 The entryway was filled with at least four different teletype machines, with a shelf of little Morse code telegraph machines overlooking them all. Phones of every imaginable make and model, from floor to ceiling. Switchboards, rotary phones, boxy wooden phones from the early 1900s, business phones and novelty phones. Colourful phone cords hanging along the walls, wires running everywhere, as most of the phones work! Every phone has an info card detailing its dates, model, use, provenance – all of it thoughtfully and lovingly displayed. Dave was quick to point out what he had found me: atop a table of multicoloured rotary phones was one red model, with Island Tel stamped into the centre of the dial. It was absolutely perfect, and it worked! I was given a detailed tour of the museum. I learned all about how switchboards worked, party line tricks for nosy eavesdropping neighbours (hint: gossip loudly about fake pregnancies), the early days of payphones, and Dave’s favourite models (the explosion-proof “Russian Princess” used in mines was a highlight). He even had a few of the early cellphone models, enormous clunkers the size of my foot. Never have I been more immersed in the world of telephones. Dave got his phone hobby started as a teenager. He grew up near a phone factory in Brockville, ON and has been collecting phones ever since. He’s got a friend in Ontario who sends him shipments of antique phones and parts. His collection is ever growing, overflowing into other rooms of the little house and creeping up the stairs. Dave wouldn’t accept money for the red phone. He told me, “I’m just happy you’re excited about this stuff!” I told him a bit more about the project, and how we’re working on trying to make it ring and play audio…and of course, he knew exactly how to make this happen, and gave me a spare part and instructions on how to make a ring generator. I left the PEI Phone Museum with so much more than I expected. A phone, instructions, waaay more excitement about the project, spare parts and even some antique glass resistors (they are so pretty!). Thinking about the execution of this piece had been stressful up until this moment. But having found Dave, the museum, and the main puzzle piece of the project spurred me on…I’m on the right track, and it’s gonna be just fine. What a little gem of an Island museum. It is a wonderful collection , just too bad that he does not have more room to expand. Met him a number of years ago and have donated some material to the museum.